Friday saw the start of the EURO2016 tournament. Cue great excitement in certain households, particularly those that are fed up with talking about the ‘other’ European issue. Although I hate to be gender divisive when talking about books, it does seem to follow that boys who are reluctant readers and prefer to play football can be enticed with a football book. Those of you who follow me weekly will be tired of my anecdote that my son learned to read from the Sky Sports News tickertape – but it’s true. I personally adore football (season ticket holder from the age of 13yrs until it was nabbed by my son), so as a girl into football and children’s books – these newly published titles won me over. For a slightly more integrationist blog, this is a book about football set in Scotland – but completely suitable and enjoyable for England fans too (or anyone). This first in the series tells the story of Calum, newly moved to the area and struggling for a place on the school football team. It doesn’t help that another child’s parent runs the team (somewhat unfairly), and that Calum doesn’t have astroturf boots – but these things are soon remedied and it becomes all about the skill. 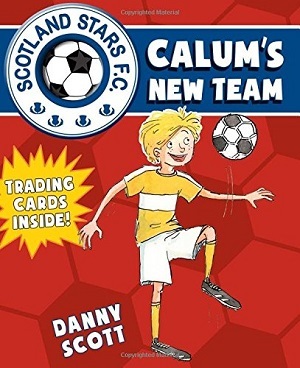 Written by Danny Scott, who works for the Scottish Book Trust, and is a huge football fan – the love for the game and for literacy shines through the text. It’s easy to read, with a manageable vocabulary and a plot that moves along quickly and realistically. For age 6+ years. A cracking addition to the team. Purchase your copy here. Three titles have been published, and there are more to follow in August. Another brilliant story from Tom Palmer that integrates love for football with historical fiction. 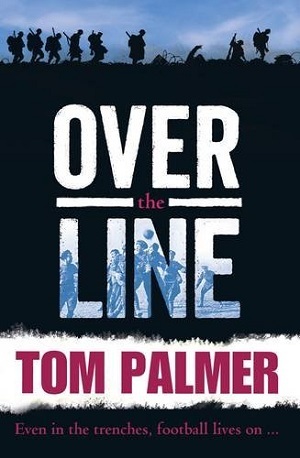 Over the Line tells a fictional story about the professional footballers who fought in the First World War. With astute attention to detail and historical research, the story maintains an integrity throughout as it pushes to tell the story of the brave men who fought in the war, but at the same time exploits the passion and drama of the beautiful game. Jack makes his debut as a professional footballer, but unfortunately for him the year is 1914, and there is huge pressure on the fit young men to sign up for the war effort. Jack bravely does so and shows the same courage and team spirit on the fields in France as on the football pitch. All the time, dreaming of when he can return home to London and play football. 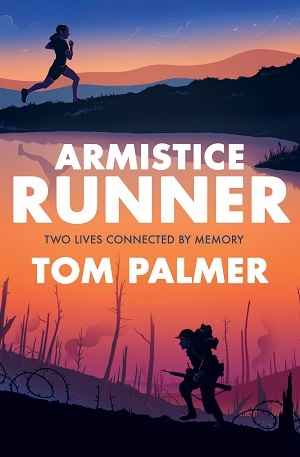 The youth of the boys fighting, the horrors of the front line and the confrontation with death and killing are all embedded within Tom Palmer’s text, but with pathos and tenderness. Jack is a warm and loveable protagonist, and although the reader knows the odds must be stacked against him, the tension is dissipated by the belief in his ability to survive and go on to triumph. What was particularly compelling was the inner thoughts of Jack, pervading each scene, and giving the reader a good insight into the sights and sounds of war, as well as the feelings behind being picked for a team – even as a professional. From the team at Barrington Stoke, so it is highly readable and not too long, but also ties in beautifully with Euro 2016 and the centenary of the Battle of the Somme. See resources here. Age 8+ years. You can buy the book here. Ever since the publication of Crossover, readers have been begging me for a similar title, but about football rather than US-focussed basketball. 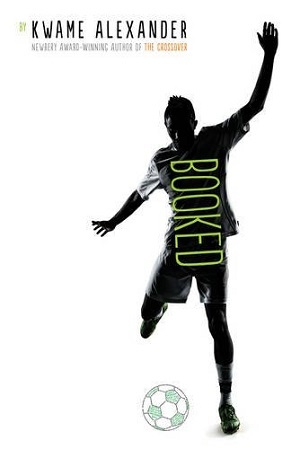 Kwame Alexander delivers again with this novel in free verse for the teen market, this time with the focus on football rather than basketball. Twelve year old Nick is the star of the football team, but he struggles to keep his head in the game when things at home start to break down. Add to the mix a school bully and a potential girlfriend, and Nick begins to see that although football may be everything, sometimes it has to take the back foot. Kwame Alexander’s word play is always fresh and exciting, and this novel doesn’t let the team down – it continues in brilliant free verse, using text messages, dialogue and even t-shirt slogans to move the plot along. There’s a wide-ranging vocabulary, all explained in footnotes, and a mixed relationship with words, as Nick’s Dad insists on him reading a dictionary to better himself, whereas Nick would rather live in the world of texting and football, until the girl he likes explains how wonderful books and words can be. Alexander’s characters are all well-rounded, even from such sparse poetry – with background stories for them all, and a wonderfully quirky school librarian who plays an integral part in Nick’s story, and a brilliantly depicted best friend. The emotion is raw, emphasised by the use of poetry, and the blank spaces between the words. Nick’s pain comes across strongly; the poem on page 59 is particularly poignant. The homage to the poet Langston Hughes is noticeable here in the different strands of poetry; the ‘jazz poetry’ that portrays the physicality of sports in particular. Alexander also integrates the titles of each poem into the poetry itself and utilises the white space on the page, all great examples of how much can be said in the implication rather than the spoken word. There’s not as much football in here as there was basketball in Crossover, and the love for the game doesn’t come across quite as strongly – the sporty poems don’t have quite the same bounce as in the previous book, but the backstory is so emotive and the characters so real that football fan readers will still appreciate the story, and reluctant readers will soak it up. Age 9+ years. You can buy a copy here. Young football fans might also like to catch CBBC’s adaptation of the Jamie Johnson football books by Dan Freedman. Starting tomorrow, Monday 13 June, at 5pm. Two skilled sports’ writers this week who have brought together their favourite sports and combined them with history. This is not revolutionary – merely apt. All sports enthusiasts tend to have a good idea of their club’s or sport’s history – whether it’s when their club last won the league, statistics from last season, or world records. These two stories incorporate ghosts and heritage – because aren’t all sportsmen haunted in some way by the legends who came before them? The author of Football Academy, among many other titles, Tom Palmer excels at bringing football and reading together. His latest series is called Wings, and cleverly incorporates RAF planes (he wrote the books whilst being the RAF Museum’s Writer in Residence) into his scintillating football stories. Four children attend a football summer camp near an old airfield, and mysteriously get sucked into the past. Part time-travel, part war-story, part football story, this slim book combines all these elements in a fast-paced action packed adventure. Jatinder is a great footballer, but a bit lax about taking risks on the field – he prefers to play it safe. But when he starts to read a book about World War I pilot Hardit Singh Malik, he gets sucked back in time and finds himself transported into a cockpit – flying Hardit’s fighter plane in enemy airspace. Tom Palmer writes with breath-taking ease – pulling the reader right into the action so that the sights and dangers of the situation seem real. With great historical detail, yet modern language and thought, Jatinder is a believable character who learns from this time travelling adventure, and carries his new sense of possibility to the football pitch. Hugely exciting, and a clever entwining of genres, Tom Palmer’s new series is one to watch. It’s also particularly suitable for struggling or dyslexic readers, and comes with a model aeroplane. Assume those wings and fly into reading here. There aren’t many books for children about rugby – and yet, outside of North America, rugby is the world’s second most popular game, behind football (soccer). The 2015 Rugby World cup attracted TV coverage in 207 territories. And so many sports books fall into the fairy story trap of just delineating an underdog triumphing. Siggins, a former sports journalist, has approached this series with a difference – incorporating Irish heritage, the supernatural and, in this particular book in the series, sportsmanship and rivalry – incredibly good topics to deal with. The series starts with Eoin at a new school, learning rugby as a new sport. By this title, Rugby Flyer, the fourth in the series, Eoin has been chosen for a special rugby summer camp and is looking to make the team heading for Twickenham, London. Supernatural elements continue in this book, as Eoin tries to solve the mystery of a Russian ghost figure and his connections to Ireland and rugby. 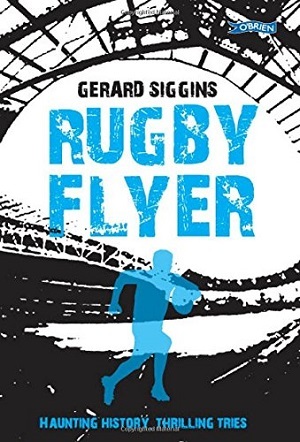 But the lessons learned during the rugby scenes are particularly poignant – Siggins incorporates the tactics of the game, handling rivalry as Eoin and his friend play on opposing teams, following the progress of Eoin’s character as he learns when winning really counts, and when to be aware of sportsmanship and how you play, but all within an exciting and developing storyline, so the reader doesn’t notice the teaching. The scenes are vivid and fast moving, and yet also woven into the book are subplots and peripheral characters – all very real, and all adding to the general action. Siggins adds a warmth to his characters, and manages to convey a special relationship between grandson and grandfather. It’s also particularly enjoyable to read the scenes of the teammates off pitch as well – their ability to get along, or not, and in particular, the scene where the squad go bowling adds to the dynamics of competitiveness, rivalry, friendship, loyalty and integral values. An intriguing series, aged 9+ years. You can try it here. Parents often regale me with their tales of despair about their children who aren’t interested in reading – they are interested only in football. To them I tell the story of one boy – so desperate to learn the football results on a Saturday afternoon that he learned to read the results ticker-tape scrolling at the bottom of the screen. He was delighted when he could read Liverpool 1-2 Tottenham, and then devastated to read Arsenal 4-1 Southampton. From the tickertape he progressed to football magazines, then to match day programmes (personally I have yet to find much duller reading material), and finally to football books. Now to my delight, the range has widened and books on other subject matters are read too. But it all started with that football tickertape. There is some great children’s fiction on football, but three new books that grabbed my attention recently are three biographies of famous footballers. They aren’t fiction – but tell non-fiction in a classic narrative style, so that non-fiction fans are drawn in and learn a story arc at the same time as gaining knowledge about their favourite footballer (and shhh! reading!) For all that I loathe celebrity culture, I recognise that this is a great way into reading for some children, and that emulating that famous football star is often the way to go. You only have to look at the success of the Premier League Reading Stars programme to see how one passion can lead to another. Gareth Bale: The Boy Who Became a Galactico by Tom and Matt Oldfield tells the story of Gareth Bale’s career, from being taken to his first match aged three to watch his uncle play, to his move to and his first goal for Real Madrid. It isn’t easy to write a biography for a child readership – as Gareth gets much older than the readership some of the emotions and relationships could be hard to understand – but the authors have pitched this perfectly. There is far more emphasis on life on the pitch than off it. In all the books, the parents and those in authority make it clear, without being patronising, that the footballers’ careers aren’t just reliant on skill. There’s an emphasis on practice, and attitude – and the importance of family and friends supporting the player. This is a team game – both on and off the pitch. 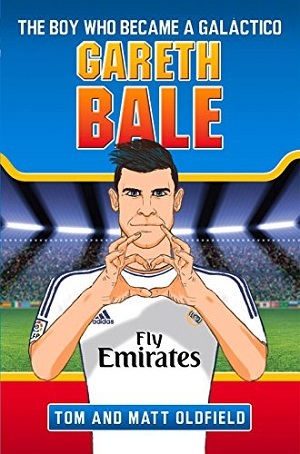 In Gareth’s story, the authors show his progression from a small skinny boy to a more bulked-out player, with nods to extensive training, the difficulties of loyalty when a player moves from one club to another, coping with the frustrations of injury, and lots of detail about specific football matches. The statistics and games are accurate – the authors have acknowledged their research at the back of the book. Even for non-football fans, it’s a good read from start to finish with a clear biographical progression (the structure is tight) and simple language. To purchase, click here. Raheem Sterling also struggles with his size in his story: Raheem Sterling: Young Lion, but his background also plays a major role in his story, and there are some touching moments about the sacrifices his mother made in order for Raheem to have his opportunities. You can buy it here. 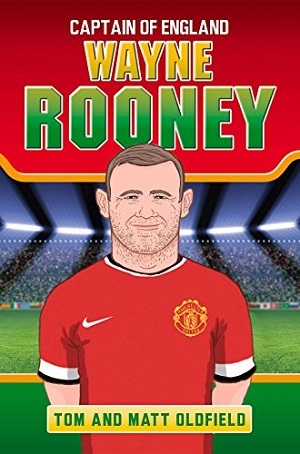 The third title in the series by Tom and Matt Oldfield is Wayne Rooney: Captain of England. You can buy it here. 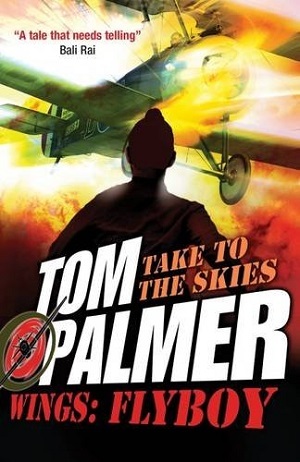 If children like reading about sport, but want fiction, then I would recommend the author Tom Palmer. 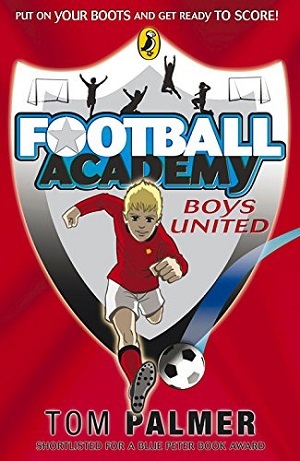 Tom has done amazing work with the Rugby World Cup – he has a series of books out on this – but he also wrote Football Academy: Boys United, which is for newly independent readers looking for a great story. Tom writes with beautiful fluency, excitement and emotion, so that the characters come alive and the story seems real. The first in the Football Academy series sees Jake try out for United’s under-twelve team. He is good, but is he good enough? Tom Palmer incorporates issues with his team-mates, friendships, relationships with family, as well as what happens when you support one team and play for another. There’s plenty of football too, and plenty of emphasis on working hard for what you want. It’s enjoyable, and inclusive with a diverse range of characters. It remains my top recommendation for encouraging young football fans to read. There are four titles in this series. To buy the first, click here. I would also recommend Frankie’s Magic Football series by Frank Lampard, and Helena Pielichaty’s Girls FC series (sadly not widely available, but it is an excellent series and reminds us that football is for girls too). All 7+ yrs. Lastly, if your child is older, leave Mal Peet’s Keeper lying around for them to find. It contains the most beautiful writing, with an amazing football/ghost story about a world-famous goalkeeper, and the importance of believing in oneself.